Many people suffer from digestive complaints such as indigestion, irritable bowel, Crohn’s disease and diverticulitis. The Gastro Intestinal Tract or Gut shunts the contents of the gut through this tube with a muscular action. The wonderfully complex walls of this tube scavenge nutrients for the body to use as building blocks and fuel. The muscular tube of the stomach and gut is hung on membranes. This expanding and contracting machine pushes the food along. Most problems occur when the muscular tube of the gut becomes tight and does not function well. When the gut becomes tight it also becomes painful. The wall of the gut becomes irritable and the normal painless function of the intestinal tract begins to be felt. 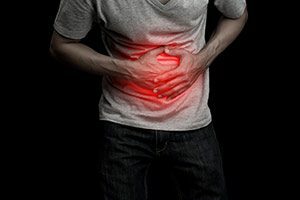 As with any other area of the body, osteopathic treatment of the gut is simply to improve the tone of the organ and restore an adequate blood supply. Your osteopath will find the areas of tightness using palpation. Manual therapy eases the muscular tightness and helps the gut function normally again.